Note: Certain length/width/height combinations may not process due to unstable conveying conditions. The CF25 Case Erector with its patented case flow is engineered to consistently meet the needs of the most demanding business. The CF25 Case Erector reduces labour in a manual operation area. ROI can be as low as months in certain applications. Small foot print with large hopper capacity of 150 cases + assuming each box when flat is 10mm. Robust construction, with positive chain and lug box drive by a single motor, ensures square boxes every time. Easy box size change over in a few minutes in simple steps, no tools required. Reliably produces boxes on demand up to 15 boxes/min, 24 hours a day. Easily integrates into slower manual packing lines or robotic / automated packing lines. Loading of hopper while still in operation (on the fly), reduces downtime. Quality Allan Bradley PLC installed. Tape options available 50mm (2”) or 75mm (3”). The CAC60-OiT special short tab cartridge for particularly small boxes can also be fitted to this machine (25mm, 1” tape tab). Compliance is in the Loveshaw DNA. Operating safely is paramount. Our machines are always at the forefront of compliance standards. Every packaging machine is subject to independent verification for compliance to the Machinery Directive, and all CE, BS and PUWER standards. All machines are checked to ensure compliance before despatch. All sales reps and service technicians are trained in risk assessments. Precision Engineering can be defined as painstaking attention to detail. A definition that captures the very essence of what Loveshaw Europe stands for. 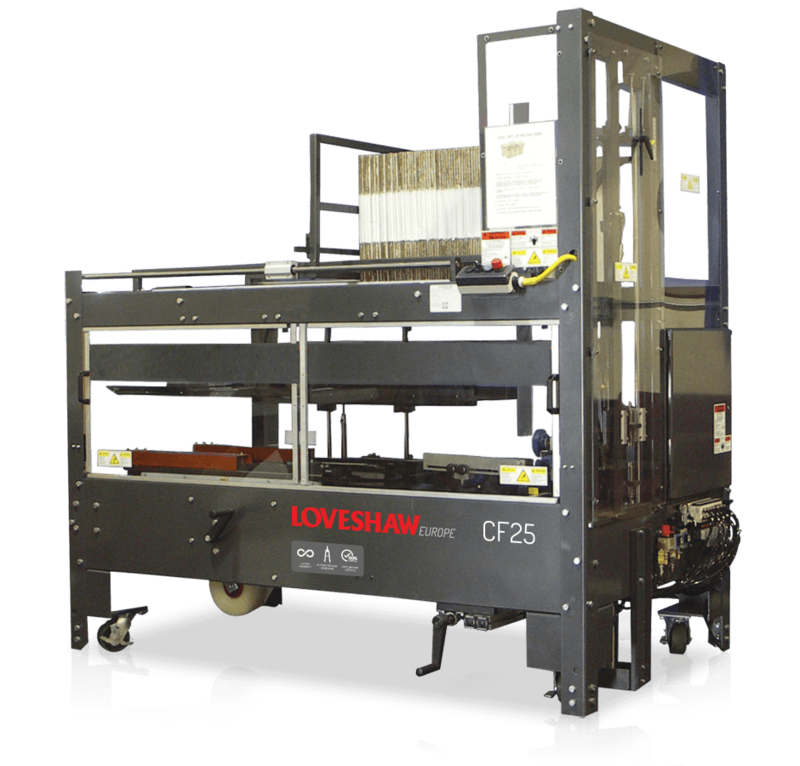 Designed to be robust and easy to maintain, Loveshaw end-of-line packaging machines can be relied upon to perform as required, and perform very well indeed. Don’t just take our word for it; discover what our customers have to say. Read our case studies. Form your own opinion. Our Promise to You; ‘When you buy a packaging machine from us, look after it properly, and we guarantee it will last you a lifetime’. Terms and conditions apply, call or email us for details +44 (0) 1264 357 511.